I’ve been working on a couple of small projects for printing. My friends, Louise and Jim, have a quilting business in Ontario called Red Red Bobbin. This is a full service quilting business that they are passionate about. Their work is truly outstanding, and I want to help them any way I can. I wanted to use part of their logo for a print image, so that I can make something for them. Here’s the start of the project. 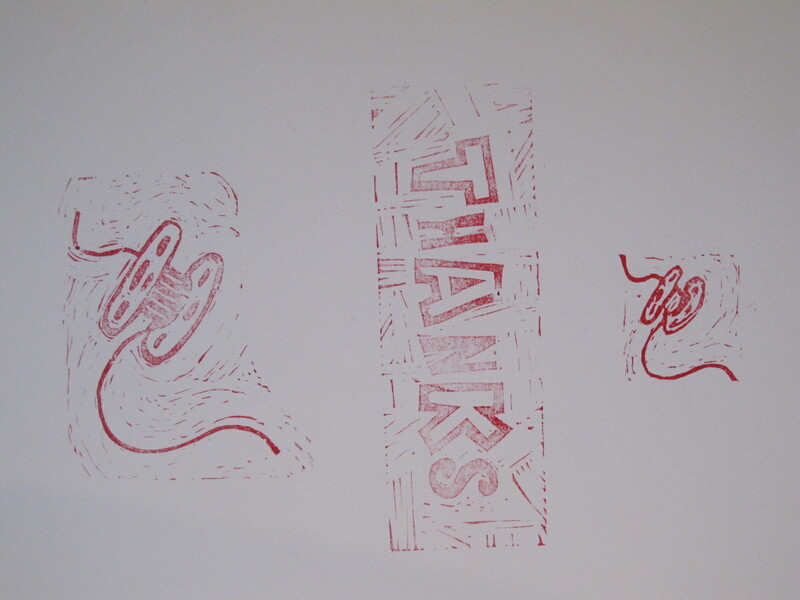 Remember – this was just printed with rubber stamp ink to check the images. I still have to work on them. The “thanks” image is also a work in progress. This is something that will be easier with 2 hands. The fingers and palm of my right hand tire easily when I use them too much. I want the healing to be done!